Starting October 29th, Blizzard will be hosting the Overwatch World Cup! This is the first World Cup event since the games’ launch back in May, 2016. 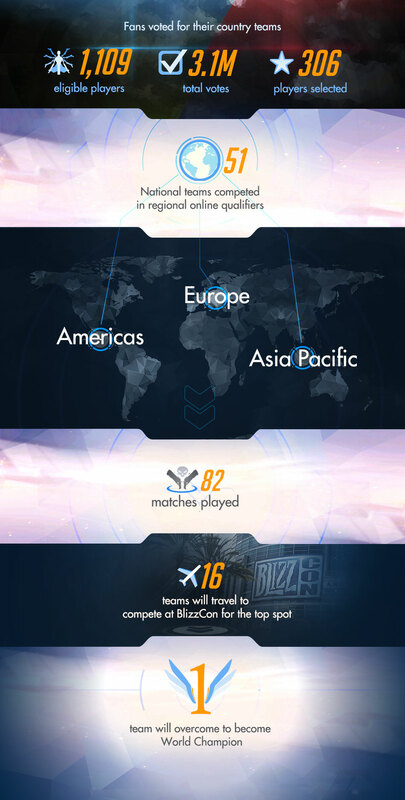 According to Blizzard, over 3 million votes were cast by members of the Overwatch community whom chose 306 of 1109 eligible players to represent one of 16 countries in 3 world regions. Team captains were allowed to choose 2 players to rounding out their team for the competition. This event is being held during the week long launch of BlizzCon 2016 which is held at the Anaheim Convention Center in California, USA on November 4th-5th. Blizzard is not only celebrating it’s 10th Blizzcon, but also it’s 25th anniversary! StarCraft, World of Warcraft, and Diablo are just some of Blizzards golden games, but many eyes will be focused on Overwatch, their latest creation that took the gamer world by storm. The Americas are represented by the USA, Canada, Brazil, and Chile, while Europe has Sweden, Germany, France, Finland, Russia, and Spain, and the Asia Pacific region teams are China, South Korea, Chinese Taipei, Singapore, Australia, and Thailand. The first match begins at 12pm PST on October 29th, 2016 with Group A, Match 1 followed immediately by Group A Match 2. You can check out the complete schedule here. All four groups will battle through matches 1 and 2 this Saturday with the last match of the day starting at 9PM PST. The United States, featuring players such as Seagull (Team Captain) and Talespin, will be facing Brazil for their first match at 2:45pm PST, October 29th. You can tune in for all of the Overwatch World Cup action for free on Blizzard’s site here! The top 8 teams will compete for the gold and glory during the weekend of Blizzcon starting November 4th! Who are you rooting for during the first Overwatch World Cup?! Leave a comment below! Previous Previous post: Pokémon Gets Spoopy!